It took a half for the Bowie Jackrabbits to realize they were playing in a district game at Henrietta on Friday, but once the second half started they found their footing. The final score reflected what most people thought the game would be like as the Jackrabbits won 51-35, but a lackluster first half made it seem like the Bearcats were in position to pull a major upset. Despite only one district win, Henrietta has had spurts of competitive play in a district full of tough teams you have to show up for every night. Bowie found out even they would have to come out to play if they wanted to win against the Bearcats. The first quarter seemed to play like the Jackrabbits would rather be doing anything else. Henrietta’s two-three zone made passes inside frustrating and minute long possessions of passing around the perimeter usually ended with a Bowie player throwing up an ill-advised three-pointer. While the Jackrabbits have some players who can knock down shots, it seemed like no one was making anything in the first half. The Bearcats on the other hand were able to make some open shots and execute their offense well in the first quarter. In every way they were outplaying Bowie in terms of energy, effort and passion. A made half court shot at the buzzer from Henrietta seemed ominous as they led 14-8 heading into the second quarter. The Jackrabbit’s defense picked things up in the second quarter, but offensively they still could not solve the Bearcats zone. 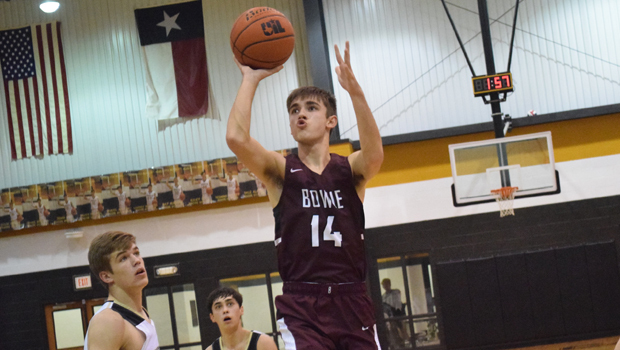 Bowie started to collect several steals from Henrietta on interior passes, but these turnovers could rarely be turned into transition opportunities. The few times they did was when the Jackrabbits scored. Despite holding the Bearcats to only five points in the quarter, the Jackrabbits still trailed 19-16 heading into halftime. Coach Jonathon Horton knew that a discussion of tactics would be useless. It did not take long to see the message had sunk in. Some scores off turnovers gave Bowie its first lead of the game 21-19 within the opening minute and half of the third quarter. There was this extra bit of energy they were playing with now that was mostly absent as they started winning lose balls, grabbing offensive rebounds and running with a purpose. Henrietta was not about to get run out of their own gym so fast. They tied the score up at 23-23 at one point and only trailed 29-25 heading into the fourth quarter. If the Bearcats could just find their offense again, they still had a chance to pull the upset. Any hope of that started to vanish at the beginning of the fourth quarter. The Jackrabbits Evan Kennedy collected a steal and scored in transition. On the next possession he knocked in a three-pointer. This helped spark Bowie for the rest of the quarter as they took a double digit 38-27 lead with 4:49 still to play. Instead of coasting towards the finish, both teams offenses came alive to finish the game in a flurry. By the end, the Jackrabbits 22 point quarter exceeded their total from the first half and almost equaled their total from three quarters as they won 51-35.